I find this an important issue to discuss. lately on the trading hub, i have seen people use their trade descriptions to talk about things other than trade. However, they shouldn't be punished, for their topic is something quite important. Apparently there has been a viewbomber lately? Someone has been typing in our usernames on NUMEROUS click-sites in attampt to kill our eggs and hatchlings. Every one of my hatchlings and eggs from a few weeks ago has died, and I am VERY ANGRY ABOUT THAT. i had a cool caveborn "Xexao" code and now it's gone and there's nothing I can do about it. I think that it would be a lot better if our usernames were NOT visible in the trading hub. Because of this stupid viewbomber I am always in fear of going to the hub again and making trades. Some hatchery sites also allow you to type up someone's username in the "add your dragons" bar and give direct links to the person's scroll when the username is typed and the dragons are successfully added. this allows the viewbomber to see what kinds of dragons we have so they can target us and kill them. i think that it would just be better if our usernames weren't in the hub. it is not fair that some people have to go through this misery when they are doing nothing more than playing a simple game. Our eggs are dying and there is nothing we can do about it. Sure, we can fog them, but if we are doing other things and are inactive then there is really nothing we can do. please fix this somehow! Genuinely asking as I haven't ever hidden my scroll.... does hiding one's scroll name on one's dragons hide it on trades, too? I'm not sure. It prevents people from actually going to your scroll to see all your dragons but the trading hub shows your name regardless. I don't think you're being viewbombed. Your dead things--including Xexao--died because they didn't get enough views. Viewbombing is when your eggs get too many views--the dead on your scroll didn't get enough views. This. None of the dragons on your scroll died from viewbombing, if they did there would be a 'died of sickness' message on the dragon's page. They simply ran out of time because they didn't get enough views... Most dragons need at *least* 2,000 views to grow up, sometimes much more then that. Dragons can grow up once their timer reaches 4 days... If they get below 4 days and haven't grown, that means they need more views. As well, viewbombing is kind of just a thing we have to deal with for now. There are a lot of suggestions people have talked about, how the site could be tweaked to stop viewbombing from killing dragons, but right now it is a thing and has been a thing for years and we just have to learn to take precautions. Hide (fog) your dragons when you aren't online to keep an eye on them. Check hatcheries to make sure they haven't been added by someone. Keep an eye on their stat numbers so you can notice if they are getting too many views too fast. This. Even though your name does not display on the dragon's page, your scrollname is attached to each trade you make, so other users can track you that way. Ever since my eggs were targeted twice I keep my scroll hidden. Even if they know your username they can't add anything if you have your scroll hidden. I only 'unlock the door' so to speak when I am ready to place them into hatcheries. Sometimes when I get something extra rare on the rare occasion I'll even fog it for that extra protection when I'm sleeping or afk. Yes indeed. You weren't bombed, but watching your own scroll is part of playing the game. Viewbombing, when it happens, is a pain, but it would not be OK to hide names on trades - people need to see who they are dealing with. If you have a trade up - hide your scroll; the trade item will still be visible. Also, in case you aren't aware what 'viewbombing' actually *does*, the result of viewbombing is that a dragon gets so many views so fast that it gets sick, and if the sickness gets bad enough it can die. IF a dragon dies from that sickness, it's death message will say so, something like 'this dragon has died of sickness'. None of your dead dragons say that, which means they could *not* have died from 'viewbombing' because they weren't sick when they died. The reason they may have done better when listed on the hub is that people will have been viewing them to see your trades. Those eggs and hatchies did NOT die of bombing. They died from too few views. Another indication is that they all died at the 7 day mark. 7 days + that few views is death by starvation. Sorry - but that's the way it works. And as Heather says - if they had been bombed, it would say they died of sickness. Just because it didn't happen before doesn't mean it didn't happen this time. Now it is POSSIBLE that someone took them OUT of the fan sites. That is the kind of thing everyone needs to watch for. But they did not have enough views, plan and simple. 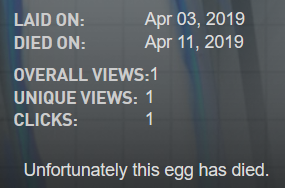 As an egg gets views, unique views, and clicks, it will eventually hatch and turn into a hatchling, but this can only happen if its death timer falls to at least 4 days while having sufficient views. You have 7 days in which to collect enough views for your egg; for more information on raising your dragon, see this article. The time at which an egg or hatchling will die is called the Time of Death (ToD). "Unfortunately this egg has died of sickness." Note the message. That isn't the message yours have. I'll note as well that general negligence to the scroll will kill more often than any viewbomber. Sure, MOST of the time you can "fire and forget" and throw your eggs into a hatchery before just forgetting about the site for a week, but there is still a very real risk of the eggs dying by starvation. Hatcheries have different amounts of traffic at different times, so it's fully possible that in this particular instance there were too many dragons in the hatchery and/or too few people viewing. Is death from negligence, not bombing. With the hatchies revive and hope for the best. Time zone/pre midnight etc stuff. The clock switched to summer time in some countries recently, and all. Then again the OP could have picked up a stunned hatchie from the AP. Doesn't account for that egg though. It's also worth mentioning that you have accepting aid on. While viewbombing is not why your eggs died, if you don't want people putting your eggs into hatcheries I'd turn that off. ...not that viewbombers bother to look at that message, of course. There's just a single flaw in your logic: DC always runs on Eastern Standard Time or Eastern Daylight Saving Time. And that's how the date always gets determined: By cave time.